Will NAFTA 2.0 Really Boost Mexican Wages? The new trade deal signed by the U.S., Mexico and Canada says much of a car should be built by workers making at least $16 an hour. Some experts are skeptical that will happen anytime soon in Mexico. 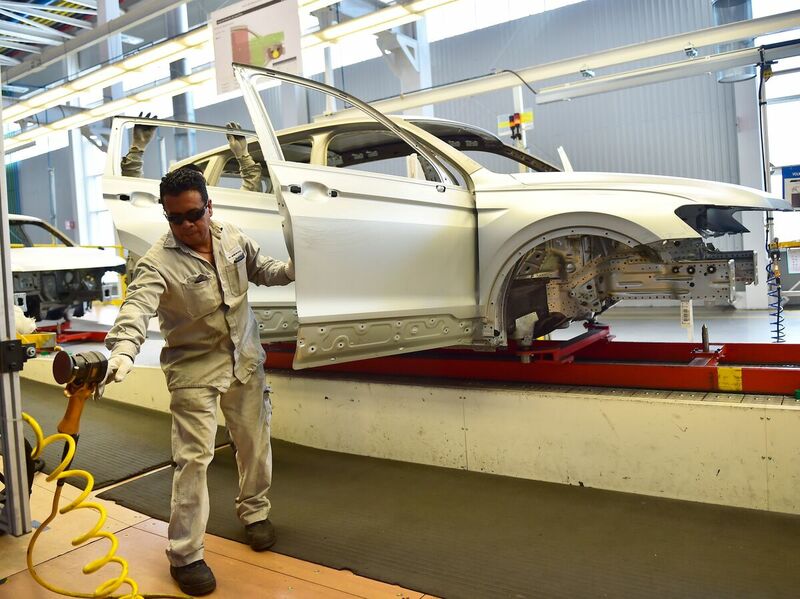 Employees work on the assembly line of the Tiguan model at the Volkswagen car plant in Puebla, central Mexico, in March. The auto sector is a key focus of the newly revised North American Free Trade Agreement. NAFTA is no more. The North American Free Trade Agreement has a new name — the United States-Mexico-Canada Agreement, or USMCA — and its rules have been updated and revamped. For Mexico, there's one rule in particular that gives workers hope higher wages are coming. It says that 40 percent of a car must be made in a plant where workers make at least $16 an hour in order to avoid U.S. import tariffs. That would mean a fivefold boost to the average Mexican autoworker's wage of $3.14 an hour. But while that looks good on paper, some experts are skeptical that it will happen anytime soon. Mexican economist Luis de la Calle says carmakers in North America already largely conform to the 40 percent rule. The companies that don't can opt to pay a 2.5 percent tariff to export the car to the U.S.
"My bet is that, in the short term, some will just choose to pay the 2.5 percent. For the others we will have to see what happens," de la Calle says. What's more, the new agreement has a transition period before the $16 an hour rule would go into effect, and the mechanism for monitoring wages hasn't even been fully worked out either. Besides, he adds, the auto industry is changing and some of these rules may be obsolete within the next 10 years. "These rules are designed to protect the cars of the past. The cars of the future will be electric with software sourced globally," he says. De la Calle was involved in Mexico's negotiation of the original NAFTA more than 20 years ago. He points out in that agreement, all television sets qualifying for zero U.S. import tariffs had to have a picture tube manufactured in North America. Flat-screen TVs quickly rendered that rule null and void. While many economists and analysts are skeptical the new USMCA will bring about a wage boost for Mexicans soon, there is hope that other provisions in the agreement can help reform Mexico's antiquated labor laws and shady union practices. Several provisions, pushed by the Trump administration, force the signatories to pass strict labor laws. Those include protections for independent unions as well as enforcement mechanisms and sanctions if a country doesn't comply. The deal also includes transparency and anti-corruption rules. 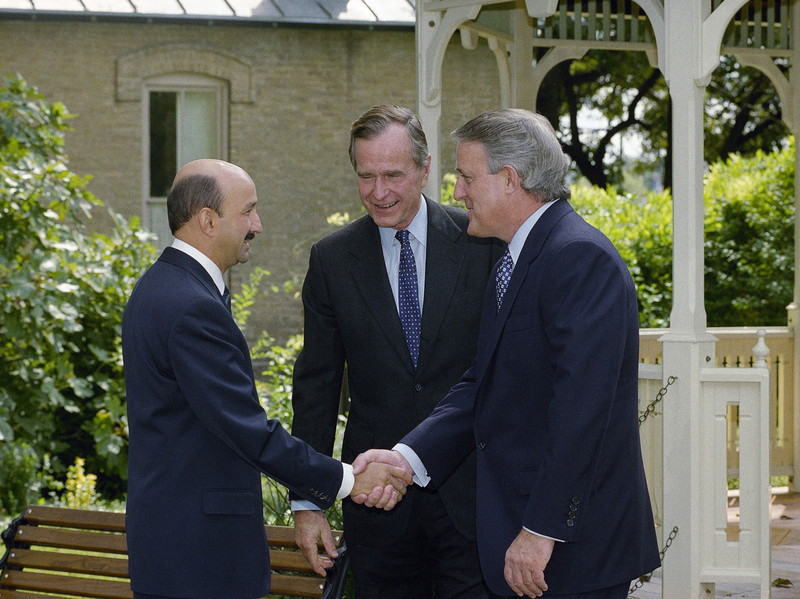 Then-Mexican President Carlos Salinas de Gortari (left) greets Canadian Prime Minister Brian Mulroney (right) and U.S. President George H.W. Bush on Oct. 7, 1992, in San Antonio, Texas, for the signing of the North American Free Trade Agreement. Eduardo García, editor-in-chief of the business news site Sentido Común, says these tough labor laws and anti-corruption rules are now an integral part of the new USMCA pact, not a side agreement like they were in the old NAFTA. That's crucial in Mexico, says García, since international treaties hold a lot of weight in the country's judicial system, right below the constitution in importance. "That's why it is so important for Mexico. It locks in many things in terms of fighting corruption and strengthening labor practices," he says. The Mexican Automotive Industry Association has been critical of requirements like the $16 rule. "There's nothing in the automotive chapter implying salary changes. There's no element in the deal itself that talks about what salaries should be paid in our country," the association's president, Eduardo Solís Sánchez, said Tuesday, according to Mexican news agency Notimex. The group declined NPR's interview request. But the new labor rules come as good news to those in Mexico who have fought for years to strengthen the country's weak, government-controlled unions, which activists say have left workers with stagnant salaries for decades. The wage gap between U.S. and Mexican workers, despite promises made in the old NAFTA to narrow it, has grown wider, according to a recent study by El Colegio de México, an academic think tank. In 1994, when the original trade pact was signed by the U.S., Canada and Mexico, autoworkers in the United States made more than five times as much as Mexicans in similar plants. In 2016, they were making nine times more. Mexican labor lawyer Arturo Alcalde says the labor provisions in the new trade deal will go a long way to help strengthen unions that for years have been controlled by pro-industry "protection contracts." They're agreements signed between a company and a union that workers never vote for and many times have never seen. "Obviously now there are whole sectors where the unions are not real," says Alcalde, who advises independent union movements in Mexico. He says in some industries, like the maquiladora or international assembly plants located along the U.S. Mexico border, 92 percent of the unions are fake, with no worker representation. He says the USMCA will force Mexico to give workers a real voice in contracts and even open up the old protection contracts to recertification. "This will help the democratization process, which obviously will push authentic contract negotiations ... and ultimately higher wages than what workers are getting paid now," he says. One study by the Center for Economic and Policy Research, a left-leaning think tank in Washington, D.C., shows Mexican wages barely budging from 1994 to 2012. The new trade deal needs final approval by the legislatures of the three negotiating countries. But Mexico's new Congress, with the incoming president's left-wing National Regeneration Movement party in control, has already begun passing many of the tough new labor laws mandated by the USMCA and constitutional reforms ordered by other trade pacts. Alcalde says he has fought for stronger laws like these for decades — and it's interesting it took President Trump's hard line on NAFTA to make them happen. "It's quite ironic," he says, given Trump's disparaging comments about Mexicans. But Alcalde adds, "It's in the best interest of our people, the working people." While Alcalde is thankful for the new union and labor laws, he too doesn't believe significant wage hikes will come soon to Mexico. He says it will take years for Mexican workers to learn and effectively exert the power they now have in the new legislation. But he says the good news is along with the laws, which he expects to be in place by the first of the year, there is also strong political will for the first time in decades in Mexico to make sure they're enforced. President-elect Andrés Manuel López Obrador, who takes office in December, campaigned on helping raise workers' standard of living. He has also appointed a 31-year-old pro-union leader to be his labor secretary. Her name is Luisa Maria Alcalde, labor lawyer Arturo Alcalde's daughter.